Clear your calendar people, the Outside Lands concert is going to be ridiculous. 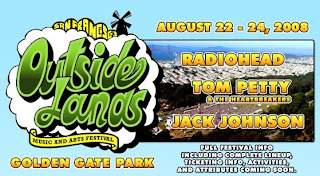 Radiohead, Tom Petty and Jack Johnson...stop it. I can't think of a better lineup and it's in Golden Gate Park! I saw Jeff Tweedy there this summer and it was great.